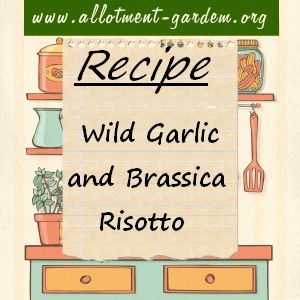 You can use wet garlic or leeks instead, the brassicas change as to what’s left in the fridge! Wild garlic- about 10-20 well washed and finely sliced leaves, or a couple of inches of wet garlic neck, or leek. Begin by gently frying onion and garlic lightly in olive oil until the onions go a bit translucent, then add the rice, stir well and fry gently until the rice starts to go translucent too. Add a glass of white wine (or first mug of stock), stir well, add mixed herbs. Traditional risotto recipes now tell you to add tiny amounts of stock and keep stirring until it’s all cooked. I tend to be ‘multi-tasking’ so add about ½ pint of stock, stir well, and keep an eye on the risotto-on a low heat, while doing other things. Each time the stock is nearly all gone add a little more and stir. After about 10 mins add brassicas- I have used cauliflower, broccoli, purple sprouting, and even cabbage. Keep stirring and adding stock – keep testing the rice to see how its going- I like a little bit of bite left, but not a nasty bullet hard centre – when its nearly cooked add smaller amounts of stock each time. If needed add more wine to the cook. Once the rice and brassicas are cooked, turn off the heat and grate about an ounce of parmesan over the risotto and stir well. Serve- I tend to grate more parmesan over it, and black pepper, and if available garnish with chives, or flowers from the wild garlic. Great with salad or fresh bread.